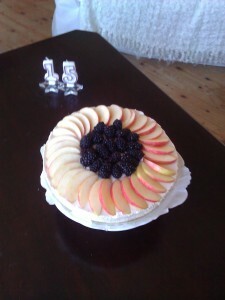 Today is the first day of spring, the spring equinox, and my daugthers 15th birthday! We were up in time to give her presents this morning before she set off to school, and, for the first time in fifteen years, I have successfully produced a birthday cake in time for her homecoming. As I look back it seems impossible that I could have failed so spectacularly for so many years, but ever since her first birthday party, when she burned her finger on her sole candle as we sung “lang zal ze leven”, I have been unable to produce a decent cake. In fact her second birthday was memorable because I forgot the cake completely, and had to run to the bakers on the corner with an hour to spare to grab the ubiquitous “slagroom taart” and stick two candles on it before the first guests arrived. We went through the gamut of themed cakes, to go with the themed parties. A princess cake, a telly tubby cake, a dolfin cake (the year she decided she would become a dolfin trainer) a cake with ponies on it. They were all disasters. The blue princess cake was pink, the ponies stood up to their tummies in icing that never hardened, the year she was 7 the baker wrote “Jolanda 6 jaar” on the cake and we had to rush back for another piece of marzipan with a 7 on it to stick over the number 6. In desperation I decided to make her cake the next year. Bought a heart shaped cakeform, found a recipe and cake decorations, and began. The quantities in the recipe were too small for the cakeform, so I had to make it twice, and once it was layered, the cake was so tall I used all the icing sugar I had to cover it decently. Pretty as it was, with candy flowers, and a pink cake ribbon, I was so stressed I vowed never to attempt it again. My daughter was in total agreement, and we have ducked out of birthday cakes for the last few years and settled for a traditional Dutch apple tart instead. But today I felt lucky, and the cheesecake looks wonderful, and smelt great whilst I was preparing it. It may have taken me fifteen years but I have finally managed to produce a cake I am proud of and one she deserves to receive. And is that not the same for relationships? If its a relationship worth working on we have our whole lives to get it right!